The Indie Credential » Blog Archive » To the person who gave us these, thank you. We at The Indie Credential started blogging the Manchester gig scene in July 2005 and have since decided to leap aboard the mp3 bandwagon just for the hell of it. Remember kids, the mp3s posted on this site are for evaluation purposes only. If you enjoy the music then go out and buy the album or go to a gig or, better still, do both. If you own the copyright for a posted song and want us to take it down then please get in touch and we will be happy to do so. To the person who gave us these, thank you. A kind person gave us wristbands to get priority access to see Battles which meant we were able to jump out of the massive queue. To the person who gave us these, thank you. Next time, sort it ATP. There’s a lot of very disappointed people. This entry was posted	on Monday, May 19th, 2008 at 1:02 am by Admin	and is filed under all tomorrows parties. You can follow any responses to this entry through the RSS 2.0 feed. You can leave a response, or trackback from your own site. 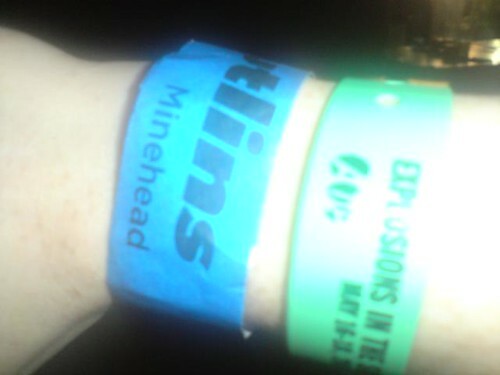 -Incredibly popular acts booked twice on the small stage and people turned away the first night are given wristbands. People turning up the second night have no idea, wait around for hours only to get thrown out and sent to the back of a 1,000 person queue so the wristbanded folks get in first. These poor people did not get back in. If wristbands to one or the other performance had been given out at check-in, as has occurred in the past, there would have been a lot less hassle for everyone. And since when does a round of drinks for 2 people cost £6.90? That’s just uncouth. Oh and the worst crime – being forced to be in the same postcode as Jens Lekman. Sounds amazing. How were Portishead? closed? already? im heart broken..